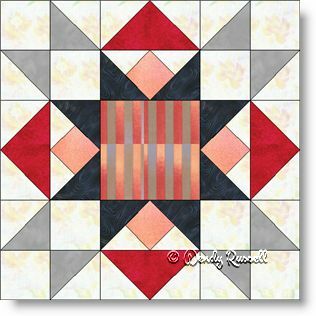 The Best of All quilt block is a nine patch which will give you some experience in using cut pieces to make a difference arrangement of the patches. I'm referring to the patches adjacent to the centre square which use a square, some half square triangles and some quarter square triangles. These pieces are joined in a frequently used patch (and I don't think there is a specific name for it), but it is not a common patch. There are also some flying geese units thrown in for good measure. All in all this is a fun sewing experience. The two sample quilts illustrated are both set on point with sashing strips, but each has a personality of its own.